Clean out the p-trap for a simple DIY sink clog fix. A p-trap (above) is a plumbing fixture that could commonly be spotted underneath the sinks in your bathroom and kitchen. 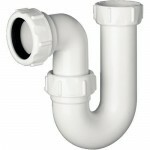 The p-trap is a curved pipe in the shape of a p that connects the drain right inside your sink to the main line. It’s purpose is to keep sewer gas from entering your house, and the water that is kept in the bottom of the trap is very good at doing just that, but what it also does is collect a lot of hair, grease, and debris. This causes the trap, and therefore your sink line, to clog up. So if your sink is backing up, try to clean out the p-trap to check for any shallow clogs that occur before the main line. How to Clean Out the P-Trap. A clog in your p-trap is not the end of the world. It’s a relatively simple fix and it’s a lot easier to clear than a clog deeper down the line. The more shallow a clog is, the easier the maintenance is and the less stress that gets put on you. It takes just a couple minutes to clean out the p-trap which could easily solve your sink clog problems if you just follow these steps. Place a bucket under the trap. Remember that the p-trap holds water; very dirty water at that. You’re not going to want that to spill all over the inside of your sink. Keep a bucket under the trap handy as well as a couple towels to make sure the operation is neat and clean. Use a pair of pliers or channel locks to loosen and remove the nuts that connect the trap to the tailpiece of the sink and the outlet pipe in the wall. Hint: always hold on firmly to the pipe that the fitting is connected to (the tailpiece and outlet pipes in this case) to make sure that the pipes don’t twist and turn. Once the trap is removed, cover the outlet pipe with a towel to keep sewer gas from getting into the house in the p-trap’s absence. Now that it’s disconnected, clean out the p-trap. There are several different methods that can be used to clean out the p-trap. You could push a straightened coat hanger through it, scrub it with a nylon brush, anything that can push out clumps of hair or grease. To be extra careful you should run some soapy water through the p-trap and make sure it is extremely clean and ensure that it will work properly when it is reassembled. Put the p-trap back together under the sink by putting it back in place and screwing the nuts back together securely. Hint: you want to screw the nuts back on with your hands first until they can’t budge anymore. If they still don’t feel tight enough then you can give a slight turn with the pliers, but you want to avoid over tightening the nuts. What Happens if the Clog Persists? If you’ve already went through the process to clean out the p-trap but your sink is still clogged, there are a couple other options available to clear the problem. For starters, you’re going to want to check the immediate sink area. If you’re dealing with your bathroom sink you may want to unscrew the pop-up and clean up the flange area in which water flows down. If you’re dealing with your kitchen sink you may want to check to see if there’s any clutter in a basket strainer or garbage disposal. If you’ve taken this step, as well as cleaning out the p-trap, and there’s still a clog in your line, then it’s likely a lot further down the line which may require the use of a snake. You can either snake the line yourself, or hire a plumber to come and do it for you.